Cartier is introducing a new flanker to its Baiser Volé perfume called Baiser Volé Lys Rose. Created by perfumer Mathilde Laurent, it’s a fruity interpretation of the original Eau de Parfum released in 2011. It plays up the lily notes with rose and red berries. Baiser Volé is also available as Eau de Toilette, Essence de Parfum, and Extrait de Parfum. All variations build on the lily theme, but they have different accents and characters. If you’ve tried it already, please comment. I’m very curious to hear what it’s like. Why did “the feral floral,” a tag line used by Cartier to describe its perfume, La Panthère, catch my attention? It’s not that I’m all that keen on the smell of unwashed animals; otherwise, the camel leather belt I bought for my husband in India (now banished to the outside closet) would have satisfied that craving and more. Cartier’s perfumery, on the other hand, is in the hands of talented Mathilde Laurent, and if anyone could make feral smell good, it would be her. La Panthère was the nickname of Jeanne Toussaint, the flamboyant artistic director of Cartier jewelry from 1933 to 1968, who was responsible for some of the most dramatic examples of Cartier’s art. Named after this tremendous character, the perfume couldn’t be just another well-behaved floral, and Laurent decided on a composition based on contrasts: moss and leather; gardenias and patchouli. Yesterday, when reviewing Valentino Valentina Acqua Floreale, Kenzo Amour I Love You, and Juicy Couture La La, I promised three more sheer spring roses. The fragrances chosen today, Cartier Eau de Cartier Goutte de Rose, Balenciaga L’Eau Rose, and Van Cleef et Arpels Féerie Spring Blossom set rose into a frame of woods and amber. In contrast to yesterday’s selection, this group is crisp and sharp, rather than soft and romantic. Christian Dior Miss Dior (that was once upon a time known as Miss Dior Chérie) is going to be released in the extrait de parfum version. Miss Dior Le Parfum was created by perfumer François Demachy. It is a richer, more floral take on the original. It includes notes of mandarin, Bulgarian rose, Turkish rose, patchouli, amber, and vanilla. 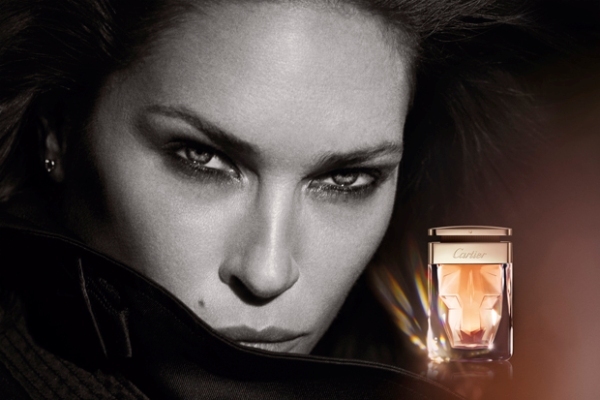 Miss Dior Le Parfum is going to be available at Dior boutiques and department store counters starting September 2012. I love this ad with Natalie Portman!